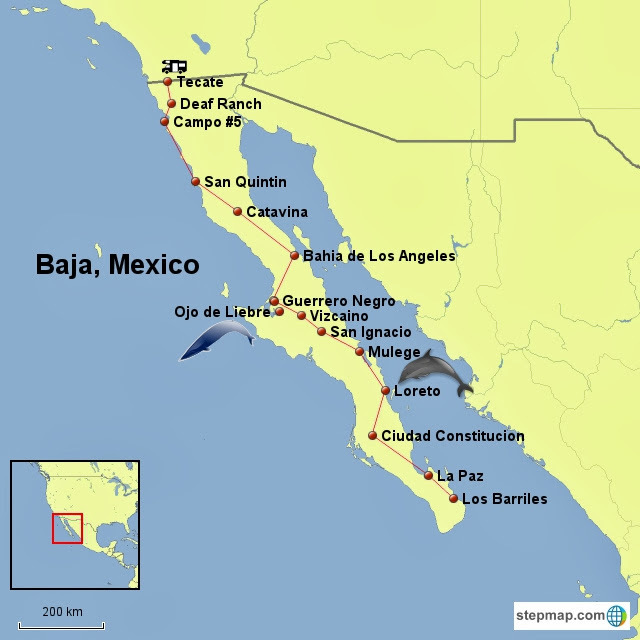 I'm starting my 2014 blog a little early to coincide with my trip to Baja, Mexico. There are four women RVers traveling together: Beth, Mitch, Tina, and me. We met up first at forum friend Sharon's house in California. We will leave our cars here while in Mexico. 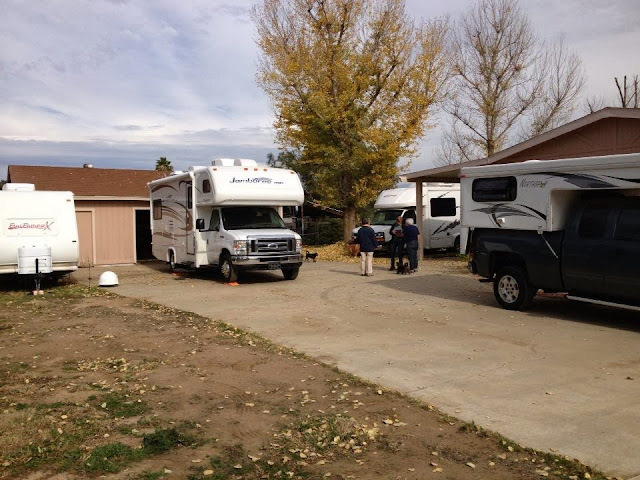 L to R: Mitch's trailer, my RV, Tina's RV, and friend Lyn's truck camper. Lyn came up to Sharon's from San Diego to meet us. Beth hadn't arrived yet. We managed to entertain ourselves while waiting for Beth. The dogs had a vet visit to get a health certificate to cross the border. Sharon gave us a ride in her RZR. Here comes Tina back from her ride. The kayoo is ready to go! Tina and I visited the Lazy Daze factory....just to look. Forum friend Laura recommended a stop at the Cup Cakery. The maple-bacon breakfast cake was to die for. Saw this mammoth on a hillside above the highway. Our CA get-together: Lyn, Sharon, Mitch, Laura, and Tina. Laura drove Tina and me to San Clemente to the beach. We enjoyed lunch on the pier and watched the many surfers. Tina and I are moving on to our rendezvous point near the border. That will free up some space for Beth when she arrives. Mitch will wait at Sharon's and come with Beth in a day or two. Below is a map of our planned Baja route and stops, although it may change as we go along....adding more stops or not stopping some places. But, it gives you an idea. There is pretty much one road south and back, with a few side trips. Where you see the RV symbol is our staging area for the border crossing at Tecate. There is a county RV park where we will camp and walk across the border to complete our paperwork for traveling in Mexico. Looking forward to your view of Mexico. I know you will find interesting sites wherever you go. Due to recent spam in comments, new comments will now await approval before publishing. This blog is intended for family and friends to follow my travels if they wish to. That Hard To Reach Sock! Where's Liz-2013? Click on the picture. Travels in the eastern U.S.